TM 266-01-060-1 exhibits a set of a set of derived features, including a long low cranium with thick and pronounced supraorbital torus, a small ape-sized braincase, and relatively weak subnasal prognathism1. This specimen preserves some teeth that show that this individual had large central upper incisors and and non-incisiform canines. The face of TM 266-01-060-1 is notably less prognathic than that of Australopithecus, and has a larger and more continuous supraorbital torus and longer braincase than that of Australopithecus. These features help to distinguish the fossil from other known genera Homo1. Brunet M, Guy F, Pilbeam D, Mackaye HT, Likius A, Ahounta D, Beauvilain A, Blondel C, Bocherens H, Boisserie J, De Bonis L, Coppens Y, Dejax J, Denys C, Duringer P, Eisenmann V, Fanone G, Fronty P, Geraads D, Lehmann T, Lihoreau F, Louchart A, Mahamat A, Merceron G, Mouchelin G, Otero O, Campomanes PP, Ponce De Leon M, Rage J, Sapanet M, Schuster M, Sudre J, Tassy P, Valentin X, Vignaud P, Viriot L, Zazzo A, and Zollikofer C. 2002. 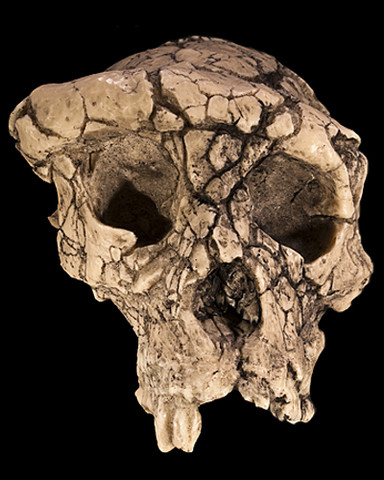 A new hominid from the Upper Miocene of Chad, Central Africa. Nature 418:145-151.